The year 2018 marks the 200th anniversary of the first recorded Chinese settler’s arrival in Australia. It has also seen a highly divisive debate about Chinese influence in Australian affairs, which is souring the Australia-China relationship. 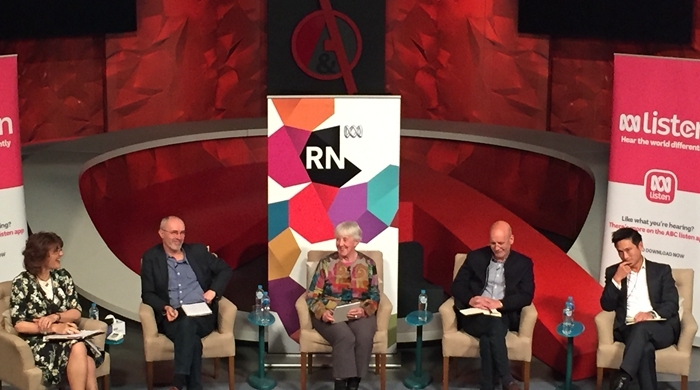 On 30 August, 2018, ABC Radio National (RN) hosted a Public Forum as part of its “China in Focus Week” (opens in a new window). ABC journalist Geraldine Doogue chaired an expert panel including ACIAC’s founding Director, Professor Jocelyn Chey, Lowy Institute Fellow Richard McGregor, Charles Sturt University Professor Clive Hamilton and Chairman of Vantage Asia Holdings Jason Yat-Sen Li to discuss the future of relations between Australia and China. The forum was attended by a full house of some two hundred people and was recorded for broadcast on Radio National “Saturday Extra” and “The Big Idea” programs. Responding to Geraldine Doogue’s invitation to the panel to speak about their highest hopes and worst fears, each of the guests in turn looked into some problems that have emerged in the debate around Australia-China relations in the last eighteen months and outlined their visions for the future. Professor Chey stated that a friendly relationship would certainly benefit both countries, while misjudgements might rob Australia of the opportunity to grow side-by-side with a rising superpower. Highlighting recent racist attacks on Chinese Australians, she cited the findings of the “Challenging Racism” research project at Western Sydney University that verified a clear increase in incidents, and said this survey provided evidentiary support for the views of other panel members who had stressed the unfortunate consequences of claims that the Chinese Communist Party was excessively active in that community. She also proposed more cultural exchanges and collaboration in arts and culture between the two countries, because these enhanced innovation and creativity. People-to-people exchanges, including tourism and education exchanges, led to greater understanding; art, music, and literature were important because they revealed the soul; language and knowledge of Chinese history and culture were essential for proper understanding of China today. Professor Chey’s comments were well received by the audience. Richard McGregor spoke about the role of the Chinese Communist Party in China’s international and bilateral relations. Jason Li spoke about the Chinese Australian community and its links to China, Hong Kong, Taiwan and other centres of Chinese settlement. Professor Clive Hamilton enlarged on his recent book The Silent Invasion, which argues that China’s United Front Department is active in Australia and particularly targets the Chinese Australian community. ACIAC Director Professor Labao Wang, key researchers Professor Ien Ang and Dr Michael Williams, together with colleagues Dr Kiu-wai Chu and Ms Lindsay Liu, attended the forum. The audio recording of the forum is available for listen online or download from the ABC website (opens in a new window) and a short video of the forum can be viewed on ABC Radio National's Facebook page (opens in a new window).